It is a wickedly satirical look into the future of the climate debate by Brad Keyes (here). The comic relief is welcome as a refreshment from pushing back against the relentless fictional claims and alarms. Lots of inside jokes and sceptics’ wish dreams concerning future misfortunes of leading alarmist figures. 2018 – ECHR agrees “Holocaust denier” is an intentionally demeaning reference to climate denial. 2018 – James Hansen blames eclipse on global warming, but others hesitate to attribute any specific EAE (extreme astronomical event) to carbon emissions. 2019 – The Trenberth Travesty is captured by satellite imagery. 2020 – Psychiatric Manual of Mental Disorders updated to deal with Weather control delusional disorder, Munchhausen’s by proxy and Medieval global warming denial. 2024 – Drawing heavily on the principles of the Delphi Technique, Naomi Oreskes changes the scientific method to the Delphi Technique. 2025 – In simultaneous media releases around the globe, every scientific body of international or national standing announces that the only safe atmospheric CO2 concentration is zero ppm. They explain: “Lowballing” is the only way to achieve 300-400 ppm. 2028 – It’s official: reputable science website SkepticalScience quietly removes “Consensus levels have plateaued” from its list of myths. 2034 – Spring is silent this year after a wind turbine kills the last American bald eagle. 2037 – As sea level rise continues to defy expectations, tracking almost 1m (3ft.) below ensemble model projections, science’s newest fear is that the Earth’s surface will be completely dry by the year 51000.
great post by hydrologist Rob Ellison confirming how the Oceans Make Climate. 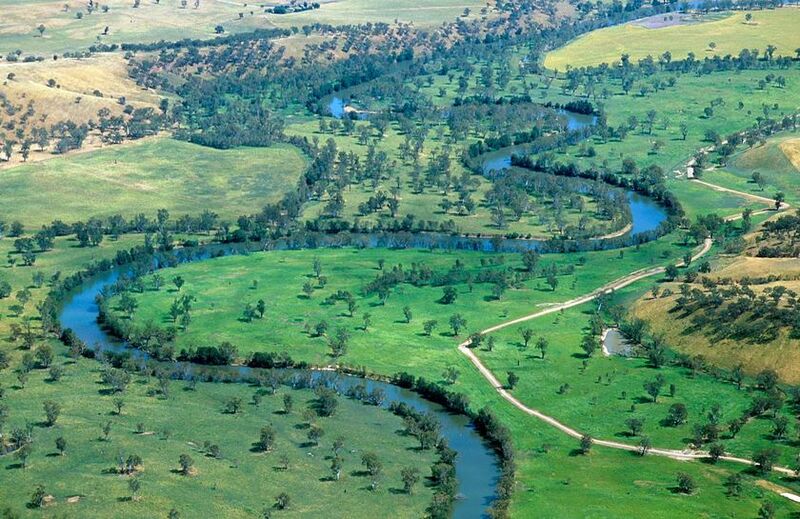 He was intrigued by discovering that rivers in eastern Australia changed form – from low energy meandering to high energy braided forms and back – every few decades. For almost 30 years he looked for the source and import of this variability, and has found it in the ocean. Changes in the Pacific Ocean state can be traced in sediment, ice cores, stalagmites and corals. A record covering the last 12,000 years was developed by Christopher Moy and colleagues from measurements of red sediment in a South American lake. More red sediment is associated with El Niño. The record shows periods of high and low El Niño activity alternating with a period of about 2,000 years. There was a shift from La Niña dominance to El Niño dominance 5000 years ago that is associated with the drying of the Sahel. There is a period around 3,500 years ago of high El Niño activity associated with the demise of the Minoan civilisation (Tsonis et al, 2010). Tessa Vance and colleagues devised a 1000 year record from salt content in an Antarctic ice core. 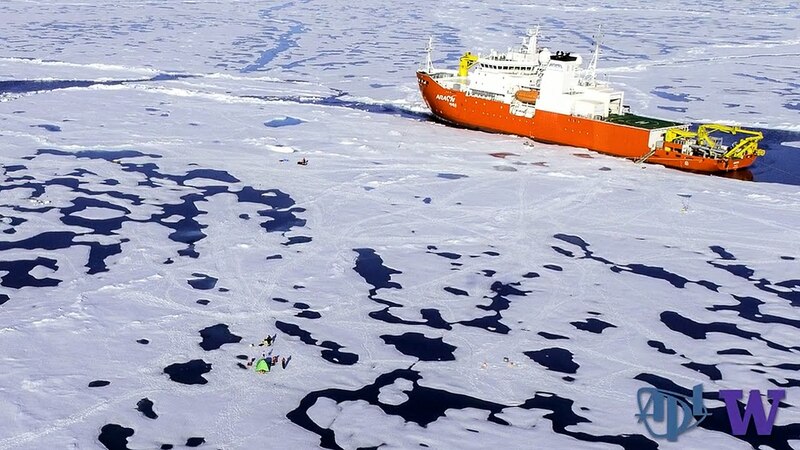 More salt is La Niña as a result of changing winds in the Southern Ocean. It revealed several interesting facts. The persistence of the 20 to 30 year pattern. A change in the period of oscillation between El Niño and La Niña states at the end of the 19th century. A 1000 year peak in El Niño frequency and intensity in the 20th century which resulted in uncharacteristically dry condition since 1920. The whole post is worth reading and a solid contribution to our understanding. Ellison’s summary is pertinent, compelling and wise. It is quite impossible to quantify natural and anthropogenic warming in the 20th century. The assumption that it was all anthropogenic is quite wrong. The early century warming was mostly natural – as was at least some of the late century warming. It seems quite likely that a natural cooling with declining solar activity – amplified through Pacific Ocean states – will counteract rather than add to future greenhouse gas warming. A return to the more common condition of La Niña dominance – and enhanced rainfall in northern and eastern Australia – seems more likely than not. I predict – on the balance of probabilities – cooler conditions in this century. But I would still argue for returning carbon to agricultural soils, restoring ecosystems and research on and development of cheap and abundant energy supplies. The former to enhance productivity in a hungry world, increase soil water holding capacity, improve drought resilience, mitigate flooding and conserve biodiversity. We may in this way sequester all greenhouse gas emissions for 20 to 30 years. The latter as a basis for desperately needed economic growth. Climate change seems very much an unnecessary consideration and tales of climate doom – based on wrong science and unfortunate policy ambitions – a diversion from practical and measured development policy. May 25, 2016: A shareholder proposition from global warming alarmists was soundly defeated today at the Annual Meeting. Activists took heart that 38% of shares were voted in favor, larger than previous such actions received. It appears that much of that support came from the Norwegian sovereign wealth fund, which is a story in its own right. The world’s largest sovereign wealth fund announced Tuesday that it would back shareholder resolutions requiring Chevron and ExxonMobil to report on how climate change could threaten assets during extreme weather events or put revenues at risk due to government efforts to transition from fossil fuels to renewable sources. Now the Norwegians deserve credit for putting their enormous profits from North Sea oil into a fund for future generations. Don’t see that in Saudia Arabia or Iran, or most other Petro-States. But their acceptance of CO2 warming dogma is as jarring as the Rockefeller Foundation funding anti-petroleum activists. Why all this guilt over energy resources? Other major investors promoting the action included: The Church Commissioners for England, Trustee of New York State Common Retirement Fund, Amundi, AXA Investment Management, BNP Paribas, CalPERS, and Legal & General Investment Management. Earlier this month, a letter signed by 1,000 professors from over 40 global universities, including Oxford and Ivy League colleges like Harvard, was sent by Positive+Investment — a campaign group launched by Cambridge students — to Exxon and Chevron’s top 20 shareholders urging they pass the resolutions. But institutional shareholders including Norway’s $872 billion sovereign wealth fund, the Church of England, and the U.S.’s largest state pension fund are already throwing their weight behind the climate cause. Norges Bank Investment Management (NBIM) publicly disclosed that it plans to vote in favor of climate impact assessment reports for both Chevron and Exxon, telling reporters earlier this month that it would relentlessly push the companies to be more open about their climate change strategies, even if the proposals didn’t pass at this year’s AGM. According to its 2015 holdings report, NBIM holds a 0.85 percent stake in Chevron worth $1.45 billion, and a 0.78 percent stake in Exxon worth $2.54 billion. “The recommendation by Exxon’s board to outright reject every single climate resolution from shareholders sends an incontestable signal to investors: it’s due time to divest from Exxon’s deception,” said May Boeve, executive director of the group 350.org, a leading proponent of the Keep it in the Ground campaign and movement for pension funds, schools and others to divest from investments in fossil fuels. Many scientists blame the greenhouse gases emitted from the burning of fossil fuels, such as crude oil and coal, for man-made climate change. ExxonMobil has been targeted because they have not given an inch to demands from alarmists. But other energy companies all also under attack. Shell shareholders overwhelmingly voted against considering a proposition to convert the company into a renewables business. Attempts to appease bullies seldom stop them from making more and bigger demands. Those companies now talking “Green” in order to be politically correct on climate change won’t be left alone to conduct their businesses. ExxonMobil knows this already, and has the subpoenas to prove it. Now that doesn’t sound so special, but in fact as you will see below, our intuition about probabilities is often misleading. Consider the classic Monty Hall Problem. Here’s the game: Do you stick with door A (original guess) or switch to the other unopened door? Does it matter? Don’t believe it? There’s a Monty Hall game (here) where you can prove it to yourself by experience that your success doubles when you change your choice after Monty eliminates one of the doors. Run the game 100 times either keeping your choice or changing it, and see the result. The game is really about re-evaluating your decisions as new information emerges. There’s another example regarding race horses here. 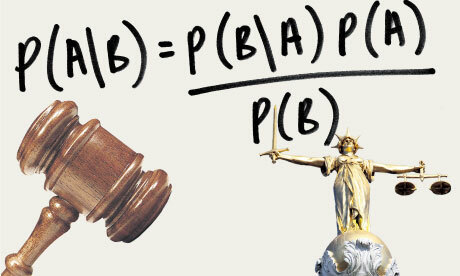 “Bayes’s Theorem: What’s the Big Deal? Here is my more general statement of that principle: The plausibility of your belief depends on the degree to which your belief–and only your belief–explains the evidence for it. The more alternative explanations there are for the evidence, the less plausible your belief is. That, to me, is the essence of Bayes’ theorem. Horgon’s statement comes very close to the legal test articulated by Bradford Hill and widely used by courts to determine causation of liability in relation to products, medical treatments or working conditions. From the above it should be clear that Bayesian inferences can be drawn when there are definite outcomes of interest and historical evidence of conditions that are predictive of one outcome or another. For example, my home weather sensor from Oregon Scientific predicts rain whenever air pressure drops significantly because that forecast will be accurate 75% of the time, based on that one condition. The Weather Network will add several other variables and will increase the probability, though maybe not always in predicting the outcomes in my backyard. When it comes to the response of GMT (Global Mean Temperatures) to increasing CO2 concentrations, or many other climate concerns, we currently lack the historical probabilities because we have yet to untangle the long-term secular trends from the noise of ongoing, normal and natural variability. In short, I think Bayesian methods are a great way to do inference within a model, but not in general a good way to assess the probability that a model or hypothesis is true (indeed, I think ‘the probability that a model or a hypothesis is true’ is generally a meaningless statement except as noted in certain narrow albeit important examples). the probability that the evidence is true regardless of whether the belief is true. The basic mathematical formula takes this form: P(B|E) = P(B) * P(E|B) / P(E), with P standing for probability, B for belief and E for evidence. P(B) is the probability that B is true, and P(E) is the probability that E is true. P(B|E) means the probability of B if E is true, and P(E|B) is the probability of E if B is true. Tests are not the event. We have a cancer test, separate from the event of actually having cancer. We have a test for spam, separate from the event of actually having a spam message. Tests are flawed. Tests detect things that don’t exist (false positive), and miss things that do exist (false negative). Tests give us test probabilities, not the real probabilities. People often consider the test results directly, without considering the errors in the tests. False positives skew results. Suppose you are searching for something really rare (1 in a million). Even with a good test, it’s likely that a positive result is really a false positive on somebody in the 999,999. Köppen climate zones as they appear in the 21st Century. That abstract, mathematically averaged world, the subject of so much media space and alarm, has almost nothing to do with the world where any of us live. Because nothing on our planet moves in unison. There’s clearly warming over the century, but also a divergence since about 1975, whereby NH rises much more than the SH. Using round numbers, the Northern Hemisphere (NH) half of the total surface combines 20% land with 30% ocean, while the SH comprises 9% land with 41% ocean. With the oceans having huge heat capacities relative to the land, the NH has much more volatility in temperatures than does the SH. But more importantly, the trends in multi-decadal warming and cooling also differ. The top-down global view needs to be supplemented with a bottom-up appreciation of the diversity of climates and their changes. The ancient Greeks were the first to classify climate zones. 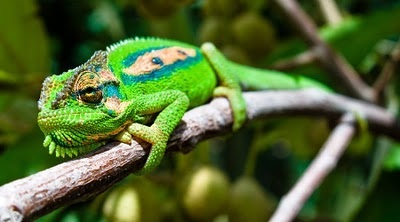 From their travels and sea-faring experiences, they called the equatorial regions Torrid, due to the heat and humidity. The mid-latitudes were considered Temperate, including their home Mediterranean Sea. Further North and South, they knew places were Frigid. Based on empirical observations, Köppen (1900) established a climate classification system which uses monthly temperature and precipitation to define boundaries of different climate types around the world. Since its inception, this system has been further developed (e.g. Köppen and Geiger, 1930; Stern et al., 2000) and widely used by geographers and climatologists around the world. The focus is on differentiating vegetation regimes, which result primarily from variations in temperature and precipitation over the seasons of the year. Now we have an interesting study that considers shifts in Köppen climate zones over time in order to identify changes in climate as practical and local/regional realities. The Köppen climate classiﬁcation consists of ﬁve major groups and a number of sub-types under each major group, as listed in Table 1. While all the major groups except B are determined by temperature only, all the sub-types except the two sub-types under E are decided based on the combined criteria relating to seasonal temperature and precipitation. Therefore, the classiﬁcation scheme as a whole represents different climate regimes of various temperature and precipitation combinations. This study used a global gridded dataset with monthly mean temperature and precipitation, covering 1901–2010, which was produced and documented by Kenji Matsuura and Cort J. Willmott from Department of Geography, University of Delaware. Station data were compiled from different sources, including Global Historical Climatology Network version 2 (GHCN2) and the Global Surface Summary of Day (GSOD).The data and associated documentations can be found at http://climate.geog.udel.edu/climate/html_pages/Global2011/. In the maps below, the Köppen classification was applied on temperature and precipitation averaged over shorter time scales, from interannual to decadal and 30 year. 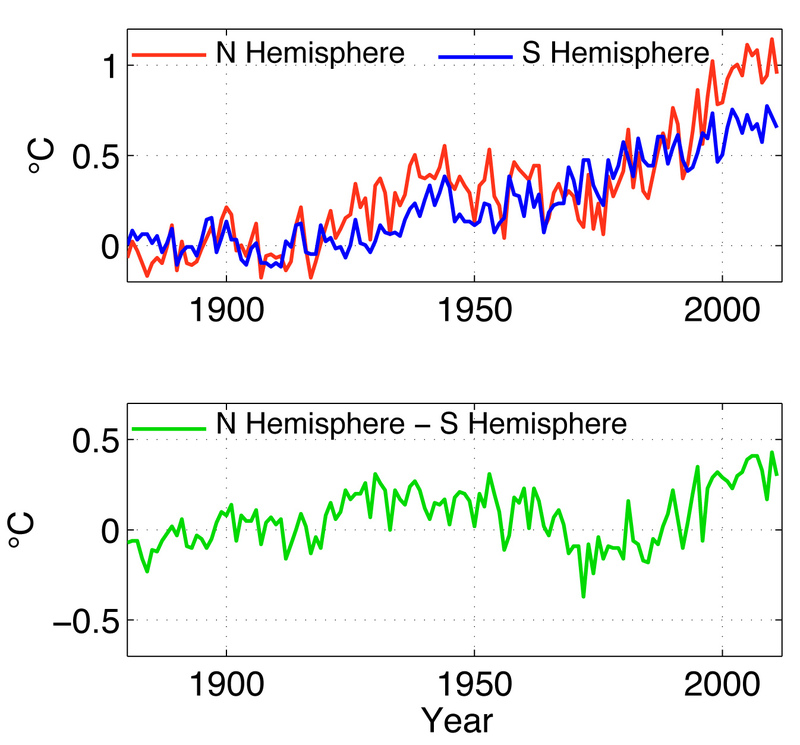 The 30 year averages were calculated with an overlap of 20 years between each sub-period, while the interannual and decadal averages did not have overlapping years. Black regions indicate areas where the major Köppen type has changed at least once during 1901–2010 for a given time scale. 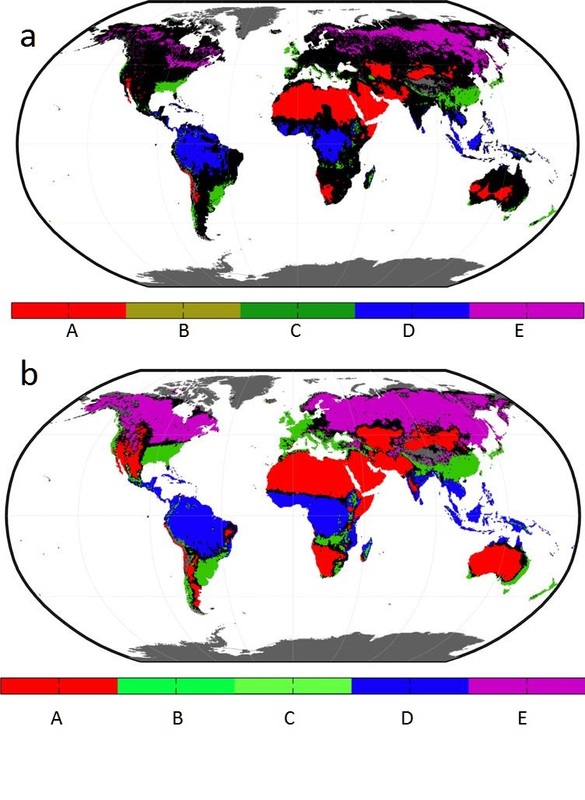 Thus, the black regions are likely to be sensitive to climate variations, while the colored regions identify spatially stable regions. Fig. 3. Temporal changes in the relative areas (area for 30 year windows minus the long term mean during 1901–2010, divided by the long term mean) of the ﬁve major Köppen groups. The 30 year window is moved forward with an interval of 10 years and the years showing the data indicates the middle of the 30 year window, e.g. 1995=1981–2010. Over the whole period (1901–2010), the mean climate distributions have a comparable pattern and portion with previous estimates. The five major groups A, B, C, D, E take up 19.4%, 28.4%, 14.6%, 22.1%, and 15.5% of the total land area on Earth respectively. Since the relative changes of the areas covered by the five major groups are all small on the 30 year time scale, the agreement indicates that the climate dataset used overall is of comparable quality with those used in other studies. On the interannual, interdecadal, and 30 year time scales, the climate type for a given grid may shift from one type to another and the spatial stability decreases towards shorter time scales. 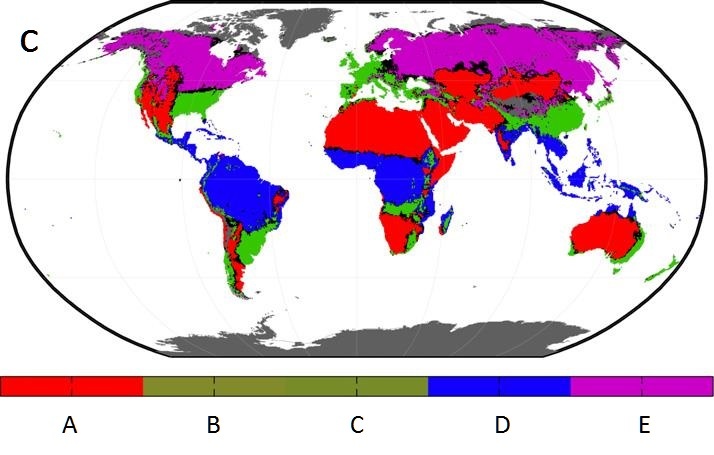 While the spatially stable climate regions identified are useful for conservation and other purposes, the instable regions mark the transition zones which deserve special attention since they may have implications for ecosystems and dynamics of the climate system. On the 30 year time scale, the dominating changes in the climate types over the whole period are that the arid regions occupied by group B (mainly type BWh) have expanded and the regions dominated by arctic climate (EF) have shrunk along with the global warming and regional precipitation changes. Climate is a term to describe a local or regional pattern of weather. There is a widely accepted system of classifying climates, based largely on distinctive seasonal variations in temperature and precipitation. Depending on how precisely you apply the criteria, there can be from 6 to 13 distinct zones just in South Africa, or 8 to 11 zones only in Hawaii. Each climate over time experiences shifts toward warming or cooling, and wetter or drier periods. One example: Fully a third of US stations showed cooling since 1950 while the others warmed. It is nonsense to average all of that and call it “Global Warming” because the net is slightly positive. Only in the fevered imaginations of CO2 activists do all of these diverse places move together in a single march toward global warming. In the chart below MASIE shows Arctic ice extent is below average and lower than 2015 at this point in the year. Looking into the details, it is clear that the marginal seas are melting earlier than last year, while the central ice pack is holding steady. Region 2015136 2016136 km2 Diff. Another difference this year is the Beaufort Gyre cranking up ten days ago, compacting ice and reducing extent by about 150k km2, and putting the loss ahead of last year. As Susan Crockford points out (here), this is not melting but ice breaking up and moving. Of course, warmists predict that will result in more melting later on, which remains to be seen. In any case, Beaufort extent is down 12% from max, which amounts to 1% of the NH ice loss so far. It is clear from the above that the bulk of ice losses are coming from Okhotsk, Barents and Bering Seas, along with Baffin Bay-St. Lawrence; all of them are marginal seas that will go down close to zero by September. The entire difference between 2016 and 2015 arises from Okhotsk starting with about 500k km2 more ice this year, and arriving at this date virtually tied with 2015. Currently, the AO is negative and is predicted to slowly trend towards neutral (Figure 1). The current negative AO is reflective of positive geopotential height anomalies across much of the Arctic, especially the North Atlantic side and mostly negative geopotential height anomalies across the mid-latitudes. We are only beginning the melt season, and the resulting minimum will depend upon the vagaries of weather between now and September. At the moment, 2016 was slightly higher than 2015 in March, and is now trending toward a lower May extent. OTOH 2016 melt season is starting without the Blob, with a declining El Nino, and a cold blob in the North Atlantic. The AO is presently neutral, giving no direction whether cloud cover will reduce the pace of melting or not. Meanwhile we can watch and appreciate the beauty of the changing ice conditions. 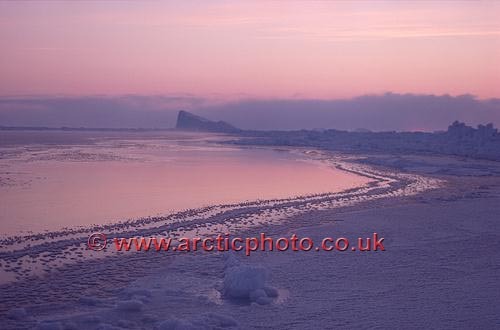 Waves and sea ice in the Arctic marginal zone. 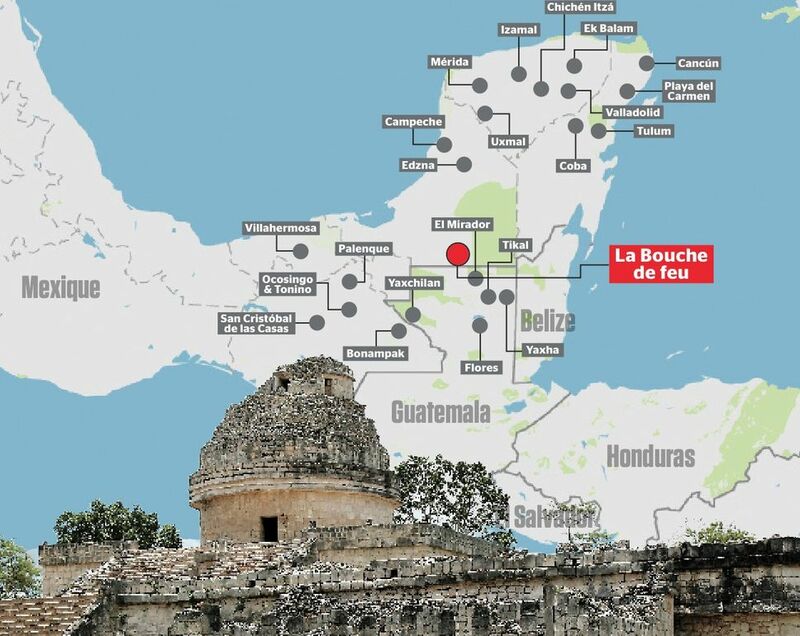 During his research, Gadoury examined 22 Mayan constellations and discovered that if he projected those constellations onto a map, the shapes corresponded perfectly with the locations of 117 Mayan cities. Incredibly, the 15-year-old was the first person to establish this important correlation. Now that is the way you do science: Find a correlation, form a theory explaining it, make a prediction, and verify it in the real world. The preliminary confirmation is by remote sensing with satellite images showing the geometrical shapes. “I did not understand why the Maya built their cities away from rivers, on marginal lands, and in the mountains. They had to have another reason, and as they worshiped the stars, the idea came to me to verify my hypothesis,” Gadoury told Le Journal de Montreal. 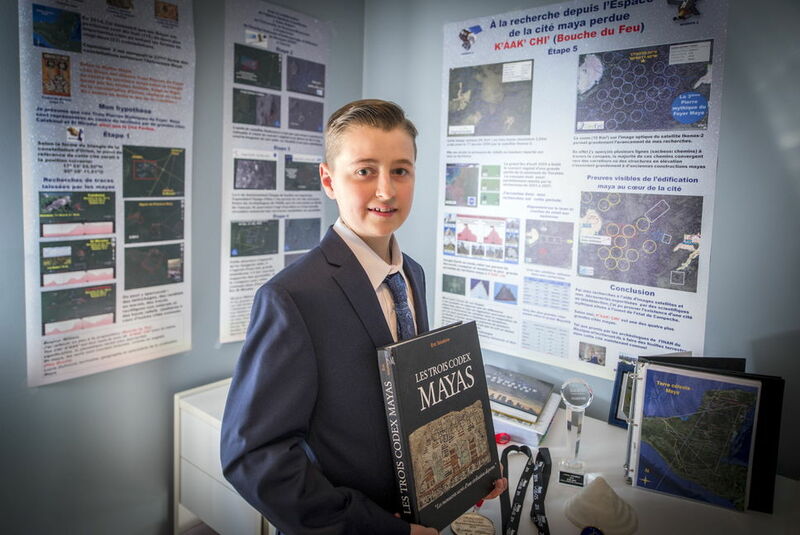 “I was really surprised and excited when I realized that the most brilliant stars of the constellations matched the largest Maya cities,” he added. What a delightful young scientist and a wonderful achievement. Sources: Earth Mystery News, Epoch Times. Scientists who closely monitored the talks in Paris said it was not the agreement that humanity really needed. By itself, it will not save the planet. The great ice sheets remain imperiled, the oceans are still rising, forests and reefs are under stress, people are dying by tens of thousands in heatwaves and floods, and the agriculture system that feeds 7 billion human beings is still at risk. 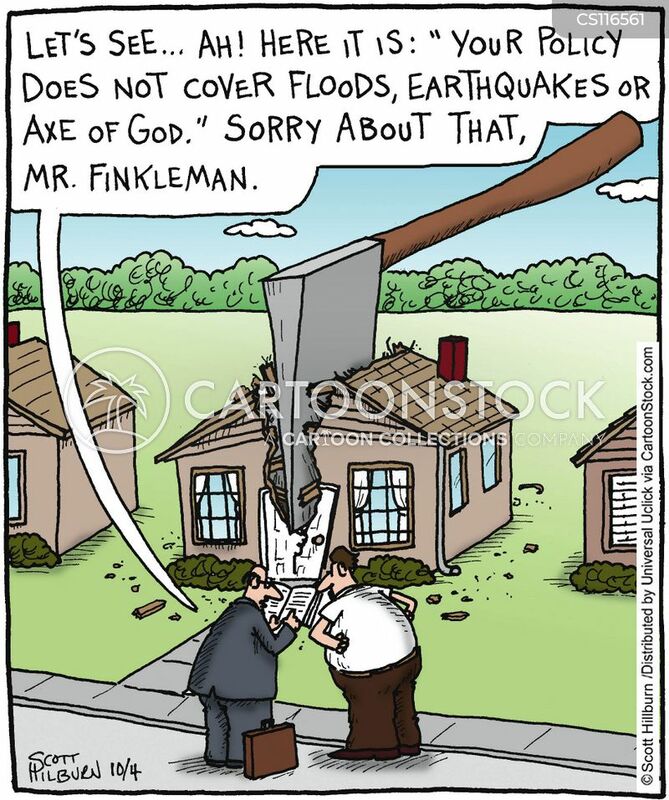 That list of calamities looks familiar from insurance policies where they would be defined as “Acts of God.” Before we caught CO2 fever, everyone accepted that natural disasters happened, unpredictably and beyond human control. Now of course, we have computer models to project scenarios where all such suffering will increase and it will be our fault. Human-induced climate change has already increased the number and strength of some of these extreme events. Over the last 50 years, much of the U.S. has seen increases in prolonged periods of excessively high temperatures, heavy downpours, and in some regions, severe floods and droughts. By late this century, models, on average, project an increase in the number of the strongest (Category 4 and 5) hurricanes. Models also project greater rainfall rates in hurricanes in a warmer climate, with increases of about 20% averaged near the center of hurricanes. But looking at the data without a warmist bias leads to a different conclusion. The trends in normalized disaster impacts show large differences between regions and weather event categories. Despite these variations, our overall conclusion is that the increasing exposure of people and economic assets is the major cause of increasing trends in disaster impacts. This holds for long-term trends in economic losses as well as the number of people affected. All the analyses in this article are based on the EM-DAT emergency database. 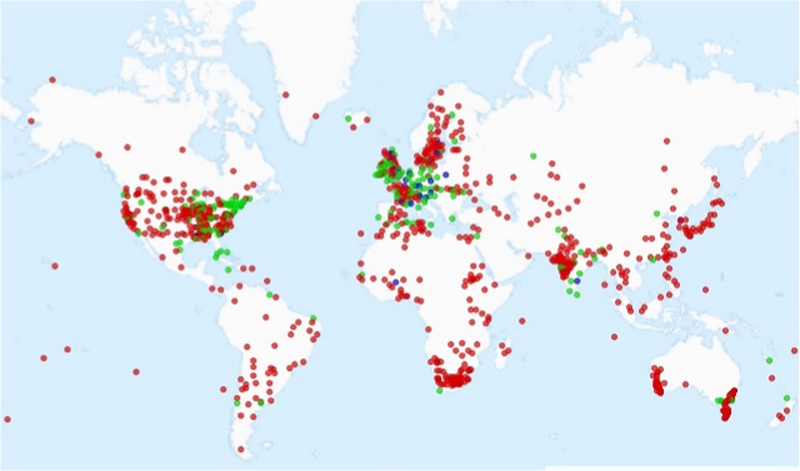 This database is open source and maintained by the World Health Organization (WHO) and the Centre for Research on the Epidemiology of Disasters (CRED) at the University of Louvain, Belgium (Guha-Sapir et al. 2012). The EM-DAT database contains disaster events from 1900 onwards, presented on a country basis. . .We aggregated country information on disasters to three economic regions: OECD countries, BRIICS countries (Brazil, Russia, India, Indonesia, China and South Africa) and the remaining countries, denoted hereafter as Rest of World (RoW) countries. OECD countries can be seen as the developed countries, BRIICS countries as upcoming economies and RoW as the developing countries. The EM-DAT database provides three disaster impact indicators for each disaster event: economic losses, the number of people affected and the number of people killed. . .The data show large differences across disaster indicators and regions: economic losses are largest in the OECD countries, the number of people affected is largest in the BRIICS countries and the number of people killed is largest in the RoW countries. Economic losses normalized for wealth (upper panel) and the number of people affected normalized for population size (lower panel). Sample period is 1980–2010. Solid lines are IRW trends for the corresponding data. The general idea behind normalization is that if we want to detect a climate signal in disaster losses, the role of changes in wealth and population should be ruled out; however, this is complicated by the fact that changes in vulnerability may also play a role. . .(After extensive research), we conclude that quantitative information on time-varying vulnerability patterns is lacking. More qualitatively, we judge that a stable vulnerability V t, as derived in this study, is not in contrast with estimates in the literature. People who are proclaiming that disasters rise with fossil fuel emissions are flying in the face of the facts, and in denial of IPCC scientists. Trends in normalized data show constant, stabilized patterns in most cases, a result consistent with findings reported in Bouwer (2011a) and references therein, Neumayer and Barthel (2011) and IPCC-SREX (2012). The absence of trends in normalized disaster burden indicators appears to be largely consistent with the absence of trends in extreme weather events. Within all the coverage of the Fort McMurray Alberta wildfire, there have also been lazy journalists linking the event to fossil fuel-driven global warming, with a special delight of this being located near the oil sands. The best call to reason has come from A Chemist in Langley, who argues for defensible science against mindless activism. Of course, he has taken some heat for being so rational. Well the climate models indicate that in the long-term (by the 2091-2100 fire regimes) climate change, if it continues unabated, should result in increased number and severity of fires in the boreal forest. However, what the data says is that right now this signal is not yet evident. While some increases may be occurring in the sub-arctic boreal forests of northern Alaska, similar effects are not yet evident in the southern boreal forests around Fort McMurray. This post compares observations with models’ projections regarding variable precipitation across the globe. 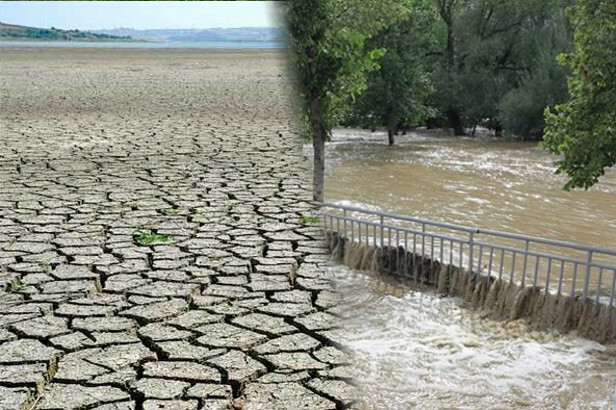 There have been many media reports that global warming produces more droughts and more flooding. That is, the models claim that dry places will get drier and wet places will get wetter because of warmer weather. And of course, the models predict future warming because CO2 continues to rise, and the model programmers believe only warming, never cooling, can be the result. Now we have a recent data-rich study of global precipitation patterns and the facts on the ground lead the authors to a different conclusion. Stations experiencing low, moderate and heavy annual precipitation did not show very different precipitation trends. This indicates deserts or jungles are neither expanding nor shrinking due to changes in precipitation patterns. It is therefore reasonable to conclude that some caution is warranted about claiming that large changes to global precipitation have occurred during the last 150 years. and blue dots the 24 stations having more than 200 years of data. This study examined the percentage change of nearly 1000 stations each having monthly totals of daily precipitation measurements for over a century. The data extended from 1700 to 2013, although most stations only had observations available beginning after 1850. The percentage change in precipitation relative to that occurring during 1961–90 was plotted for various countries as well as the continents excluding Antarctica. There are year to year as well as decadal fluctuations of precipitation that are undoubtedly influenced by effects such as the El Nino Southern Oscillation (ENSO) (Davey et al., 2014) and the North Atlantic Oscillation (NAO) (Lopez-Moreno et al., 2011). However, most trends over a prolonged period of a century or longer are consistent with little precipitation change.Similarly, data plotted for a number of countries and or regions thereof that each have a substantial number of stations, show few statistically significant trends. Fig. 8. 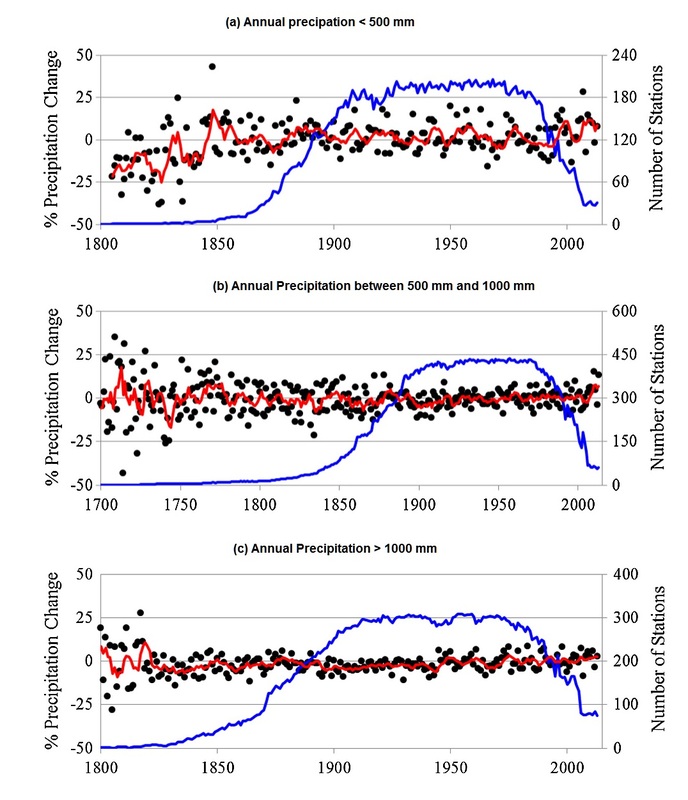 Effect of total precipitation on percentage precipitation change relative to 1961–90 for stations having total annual precipitation (a) less than 500 mm, (b) 500 to 1000 mm, (c) more than 1000 mm. The red curve is the moving 5 year average while the blue curve shows the number of stations. 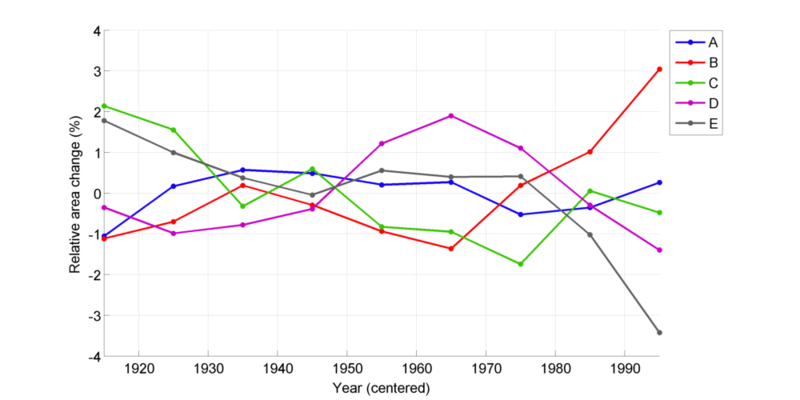 Considering only years having at least 10 stations reporting data, the trends in units of % per century are: (a) 1.4 ± 2.8 during 1854–2013, (b) 0.9 ± 1.1 during 1774–2013 and (c) 2.4 ± 1.2 during 1832–2013. Fig. 8 compares the percentage precipitation change for dry stations (total precipitation <500 mm), stations experiencing moderate rainfall (between 500 and 1000 mm) and wet stations (total precipitation >1000 mm). There is no dramatic difference. Hence, one cannot conclude that dry areas are becoming drier nor wet areas wetter. A change of 1% per century corresponds to a precipitation change of 0.09 mm/year or 9 mm/century. As a background for how precipitation is distributed around the world, see the post: Here Comes the Rain Again. Along with temperatures, precipitation is the other main determinant of climates, properly understood as distinctive local and regional patterns of weather. As the above study shows, climate change from precipitation change is vanishingly small. Data vs. Models #1 was Arctic Warming.